After a developing period of 1.5 years 3D Ninja, the largest reseller of 3D printers in The Netherlands, officially launches http://www.ifind3d.com, the world's largest search engine for 3D printable models, containing 740.029 designs. IFind3D combines all online libraries for 3D printable models in one fast and responsive engine, making it easy for end users to find 3D printable models. 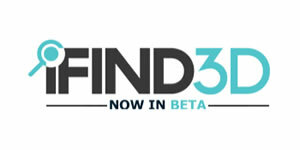 IFind3D uses state of the art algorithms, assuring the best results are served at all time, using almost 100 different variables by integrating an AI services using IBM's supercomputer 'Watson'.